It's close to midnight, maybe just a few minutes before, and Robin Samiljan is standing in her backyard, surrounded by vibrant plants and trees, a half-empty silent fountain. Maybe her dog is outside with her or curled up in the living room, sleeping. However dark it may be, Samiljan is awash in light and color. Paint splatters on her clothes and skin, her dark hair a bit mussed, her half-moon earrings clipped tightly into her ears. She alternates between watching the full moon hanging heavy in the sky and looking down at her paper, on which, in bursts and sparks, the moon's reflection and image slowly emerges. For a while now, Samiljan, the Swampscott Arts Association's president, has been painting each month's full moon. At first, she did it "just because." She hadn't yet thought ahead seven months to this most recent full moon, when she was more than halfway done with the year. In time, she thinks she may even turn the series of 12 paintings, one for each month, into a calendar. Already, she's printed note cards featuring the finished full moon paintings as well as giclée prints. Perhaps she's a bit obsessed, or even possessed, by the idea. She readily admits to feeling as if she's along for the ride, swept up in a tide - of color, emotion, transient feelings - that she had never before encountered in her artwork. She calls it "passion and high energy," a response to the everyday events going on around her. "Every one of these moons show where I was and how I felt," she explains. She's not interested in painting the moon. "It's not about being literal," she says. "It's about recreating a feeling." But she is interested in leaving behind her feelings so that when someone else sees the painting, they, too, may walk away from it with that same feeling, or at least with a better understanding of Samiljan, something she's still trying to figure out about herself. 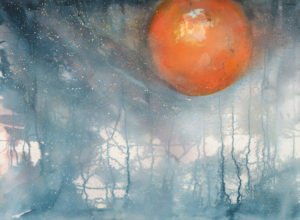 At first, Samiljan painted watercolors, the same format she uses for her moons. She studied with Nordia Kay, showed each year at Kay's Grosvenor Park show, and had a few paintings accepted into local and regional shows. As much as Kay helped and guided her ("she's like family, a good friend," Samiljan says of Kay), Samiljan felt there was something just beyond the paper's edge, something just waiting for her to harness and unleash. After reading Jeanne Carbonetti's series of books: "Tao of Watercolor," "Zen of Creative Painting," "Yoga of Drawing" and "Making Pearls," Samiljan decided there was something this artist was doing that linked up to how she felt inside. She scheduled a time to meet with the artist/author and traveled alone to Carbonetti's Vermont studio and home for a two-day intense one-on-one session. She returned this summer for a week-long workshop attended by other artists. When she emerged, still artistically unformed but more sure of her grip on the paintbrush, she felt as if something inside her had opened its eyes and awakened. Painting, Samiljan learned, was less about recreating what it is she saw, but is, in fact, more about transferring energy. Accessibility, then, becomes contingent on each specific viewer's impression. There's something in her paintings she hopes appeals to a wide audience, she says. She uses the Farmer's Almanac to best gauge when each month's full moon will rise and sit for its portrait. She printed out the 2004 information from a Web site but has already purchased the 2005 almanac in case she decides to continue the series next year. Patience, Samiljan admits, has never been one of her virtues, however, and waiting to show the moon series has been one of the hardest parts of the experience. "I've never done anything that took this long," she says. "I want everything yesterday. I never realized that this is what I'd be doing." This far into the project, however, she's begun thinking of the series as being just that - a series of paintings with a beginning, a middle and an end. Each month's moon becomes part of the whole, even if each painting shows the very same moon, a fact Samiljan says is hard to believe when looking at her paintings. There are pinks and yellows wildly thrown on the paper, lush greens and vibrant blues. Most of the paintings were done in her backyard, though some of the months she's been elsewhere and has painted where she was. Along with working on her lunar landscapes, she runs the SAA, is a Marblehead Arts Association council member and is a member of the Cambridge Arts Association. She sends out paintings each month to juried shows and, just recently, she had her first painting accepted into a nationally juried show, Autumn in America, in Ithaca, NY. However easy she's finding art these days, she admits to having survived a number of "starving artist" years. "Being an artist is really hard," she says, "because you have to get rejected a lot." She never knows each month what it is she will paint, though with the finished ones serving as a template of sorts, she no longer worries that one of the full moon nights, she will stand in her backyard, in front of her blank paper and be unable to render what it is she sees. She said she's beginning to learn how best to trust what it is she's feeling. "I had to learn and learn and learn and learn and I was afraid to do things that broke the rules," she said. "Sometimes I used to wish I could be dull with my paint since there's always so much going on, but now I think I'm just ready to have some fun."